Background: Accurate and reliable assessment of functional recovery remains a challenge. Grip strength testing is a validated method for measuring function of the median nerve-innervated extrinsic digital flexors. Because the rat must be dangled by the tail to elicit grasp of the force transducer bar, this method is limited by behavioral variability and poor control of the vector and speed of distraction. Isometric tetanic force testing (ITFT) is accurate and reliable but does not allow for serial in vivo measurements. Combining aspects of these methods, we developed a novel technique for functional assessment in which grip strength is measured with percutaneous electrical stimulation of the median nerve to elicit grasping via isometric, tetanic contraction of the extrinsic digital flexors. We hypothesize that stimulated grip strength testing (sGST) provides greater accuracy and reliability than volitional grip strength testing (vGST) and similar quality data as ITFT with the added benefit of allowing for serial in vivo measurements. 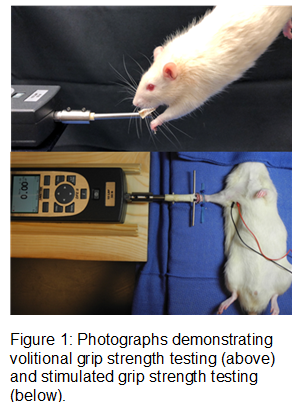 Methods: Function in both the right and left forelimbs was measured with sGST, vGST, and ITFT (n=10 rats), with the assumption that a perfect test would produce an average ratio (L/R) approaching one. Results: sGST was more precise than vGST in measuring side-to-side equivalence (p<0.05). 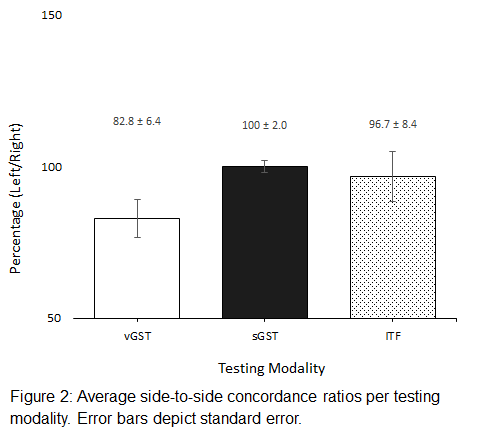 sGST demonstrated comparable side-to-side equivalence as ITFT, but with less variability in measurements (Figure 2). Conclusion: Stimulated grip strength testing (sGST) is a novel method for assessing functional recovery that provides more accurate and reliable data than vGST and similar quality data as ITFT with the added benefit of allowing for serial in vivo measurements. It is less technically demanding and time-consuming than ITFT and requires less expensive equipment to perform.